The UK remains the only country in Europe to recruit 16-year-olds into its armed forces. This is despite recommendations from the United Nations committee on the rights of the child and the parliamentary joint committee that the minimum age for recruitment be raised to 18. According to ForcesWatch, a network that scrutinises the ethical basis of the armed forces’ recruitment of young people, that it costs twice as much to train a 16-year-old as it does an adult because of the longer training and higher drop-out rate. It is a curious anomaly that 16-year-olds cannot vote, or drive a car – but they can join the army. The UK military recruits 2,000 16 to 17-year-olds, making up a quarter of all new enlistments, according to figures compiled in a parliamentary briefing by Child Soldiers International. Following an outcry over the deployment of 17-year-olds to the Gulf War in 1991, and to Kosovo in 1999, the armed forces amended its rules stopping soldiers under 18 from being sent on operations where there was a possibility of fighting. Despite this, at least 20 soldiers aged 17 are known to have served in Afghanistan and Iraq due to errors by the MoD. According to the UN research, that 16-year-old recruits are much more likely than adults to suffer bullying and harassment, to develop serious mental health problems, to be injured in training, and to be killed once they reach deployable age. The Department for Education’s (DfE) ‘military skills and ethos programme’ encompasses a number of schemes including extended cadet provision within state schools, the Troops to Teachers scheme and substitute provision for pupils at risk of becoming disengaged, including the Military to Mentors and Challenger Troop, a full me uniformed programme for 10-16 year olds. In 2012, the Government chose Armed Forces Day to announce their aim of creating 100 new cadet units in English state schools. In 2015 the military ethos promoted in schools by the Ministry of Defence and the armed forces is both more prevalent and more sinister. However, there can be little doubt that the thousands of annual visits to secondary schools and colleges made by the armed forces, together with the estimated £26m that the MoD spends each year on combined cadet force units, are designed to act as an enticement to a career in the services. As the learning resource package, sent in 2014 to every school in the UK by the Department for Education, noted, it is “always challenging and fun”. After a six-month trial, 16-year-olds are locked in to the forces until they reach 22, meaning a life-changing decision is made at a brutally young age, says Veterans for Peace co-ordinator Ben Griffin, 37, who served in Northern Ireland, Iraq and Afghanistan in the SAS and the Parachute Regiment. He said his experiences gave him an “obligation” to tell teenagers the truth. Meanwhile, as the armed forces continue with their policy of targeting their school visits excessively to schools in deprived areas and children from low-income families, the Department of Education ignores the UN’s recommendations that some form of peace education should be part of the curriculum in UK state schools, and supports initiatives encouraging a military ethos. 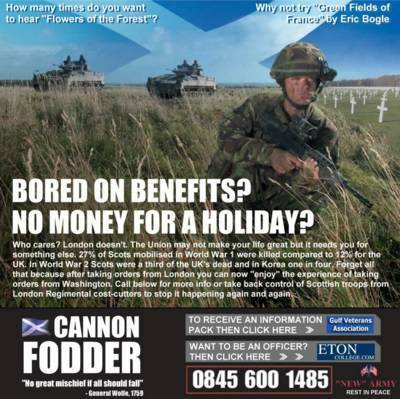 According to ForcesWatch report, the armed forces recorded 1783 visits to 377 Scottish education institutions. 1455 visits were to 303 Scottish state secondary schools, of which 42% were made by the Army, 31% by the Navy and 27% by the RAF during the academic years of 2010-11 and 2011-12. This equates to an average of two visits per year for every state secondary school in Scotland. The figures show that Edinburgh, Fife, North Lanarkshire, Angus, Dumfries & Galloway, and Perth & Kinross recorded the highest number of visits to state secondary schools from the armed forces as a whole. In addition, all Army visits were made to state secondary schools; they made no visits to independent schools. The military rely on a very narrow definition of ‘recruitment’ to counter fears that it is taking place in schools. However, the picture presented here suggests that, with a more commonly accepted understanding of the term, significant ethical questions are raised for both schools and armed forces personnel that visit them. A comparison with the Scottish Index of Multiple Deprivation also suggests that there is not a straightforward link between deprivation indicators for individual schools and number of visits; while over half of schools which received 10 or more visits in two years (18) were either in or adjacent to the 30% most deprived areas in Scotland, 10 of these schools were in the 30% of least deprived areas and not adjacent to other areas of deprivation. One factor that could explain why there is no apparent link between indicators of deprivation and the number of armed forces visits to schools in Scotland, while the London study does show a link, is that the proportion of schools visited is much higher in Scotland than in London; it is possible that the high level of coverage renders prioritisation between Scottish schools on socio-economic grounds less important. Both ForcesWatch and Scotland’s largest teaching union the Educational Institute of Scotland (EIS) have called on the Scottish Parliament to follow the Welsh Assembly’s lead and officially debate the issue. “We hope the Scottish Parliament will look at this issue and how to ensure that schools are not used to further non-educational agendas,” Sangster added. A brilliant article and campaign. By calling it what it is ‘ british child soldiers’ and putting Britain alongside other countries that do this can be a powerful message and lead such a campaign. I am very keen to be involved with joining and help in stepping up all efforts to end this policy. They will only continue with it if we keep silent. The news this week of widespread bullying in the armed forces leading to death in some cases we must do all we can to protect all soldiers and especially new recruits. The fact that we are the only country in europe that recruits children says a lot about how our governments view the welfare of children. Strange, but I seem to remember most of this article somewhere else. The recruiting visits are actually to deliver literature. As I librarian my wife had these visits. The problem is that the model of the person joining up to escape unemployment is not something which you get with youth. The British forces have a tradition of Junior Leaders, Apprenticeships where they take on people who are identified as having the potential for middle management. Maggie got rid of the Junior Leaders etc, and quite quickly the army ran out of the best of the recruits. The reason was simple. The kind of person with the stability and ability which was required to fulfil the technician level jobs were getting them in civi. street, and had a marked disinclination to go for the forces which inevitably begins with a period of basic training which is going to be demanding. Young people who go for example to the Army Apprentice college at Harrogate have to be keen and fit. Yes there are problems with Bullying, there are also problems with Bullying in Schools and it is up to everyone to stamp on it. A little bit of thought would remind you that it costs several thousand pounds to get a recruit in the Army Training Regiment, so who blow it by making like unbearable? The reason for the injury rate and the subsequent risk of injury is that as kids they are keen, and take risks and as adults they are more likely to be in leadership rolls and therefore expose themselves to more danger. The EIS has a tradition of discouraging young people from forces careers. This is unfortunate that they seek to discourage young people form a career which does genuinely offer great challenges and great rewards where young people do have the opportunities to get on and gain an education which often they have missed from gaining from the members of the EIS. Of course the whole question of youth enlistment has to be looked at, but not in the rather hysterical accusatory way which we have all read before and is not more accurate now than it was the first time I read it. “problems with bullying” – maybe best we don’t go there? Where was the somewhere else? Would it not be easier and cheaper to deliver the literature by post? You think the forces take on people so they can have a career in middle management?! The problem with bullying in the army is the secrecy involved whereas in schools it is much more easy to see. The army today in times of war on a global scale is not a career! Would you explain in what way the article is hysterical and where you have read it before? Yes the Sergeants and the Warrant Officers run the army. I don’t know where I saw substantially the same article, but I’m sure that I have seen it. That is what is annoying me. With Careers literature it is almost as important to extract the old stuff as it is to put in new stuff, (and I speak as someone who was a Careers Officer once). The trouble with bullying anywhere is that it is done in secrecy. I find that the article is unbalanced over states the case and as I say recycled. And yes lots of people have careers in the Forces, but then whole system is organised that there are many who spend a short time and relatively few who do the full career. I would like to reassure him that the Quakers have produced a very readable report, The New Tide of Militarisation, which encourages us all to think about this issue. Forces Watch is another organisation that is specifically trying to raise awareness about this. It is not just in our schools, but in wider society as well that we can see this militarisation. Excellent article. I’m from Northern Ireland and the militarisation of children in Northern Ireland can be shown as a cumulative process which begins with their acceptance of violence as a political means and ends with their mobilisation. For the past few years we have marked International Peace Day with children from several local schools who come together to discuss some of the issues around militarism and to explore the practice of peace. If we really want to build a better world, the government should invest in peace education, not use schools to boost military recruitment. Given the tragedy of child soldiers in many parts of our violent world, and given the obscene commercialisation of war games for children, is not the promotion of military cadet forces in our schools more than reason enough for parents in Cameron’s increasingly militarised Britain to say no to the preparation of our young generation for tomorrow’s killing fields? I just want to say that militarism in schools leads to 2 kinds of recruitment: the recruitment of teenagers into the armed forces, and the recruitment of wider society to be war ready. As an erstwhile youth worker, who sometimes worked alongside teachers within schools, I am very surprised to read that some schools are getting 5 visits per year from the armed forces. It is normally very, very difficult for outside agencies to get access to schools to deliver inputs on say, health, citizen issues, emotional wellbeing, crime etc. The curriculum is so full and there are few very slots available to non-education dept. staff. Makes me wonder if the armed forces have “special case” status. No references are given, and the article itself doesn’t pick up on these percentages, which are heartbreaking, outrageous, and indeed approach a sinister level. None of us want to be recycling other than solidly substantiated statistics, particularly on such a profoundly elemental matter. A bit of anchorage for these numbers would be appreciated. The WW1 figures match what I’ve read elsewhere. Never seen the others before. BTW I think it was Prime Minister Pitt, rather than General Wolfe who said ‘no great mischief if they fall’ – about Highland Regiments.